Learn from Profiting After The Sale how to increase the amount of sales you make simply by selling more products to the same amount of customers. Is There Only One Buy Now Button On Your Page? If You Think So, You Are Flushing Good Money Down The Drain! I started building my websites and driving the traffic to buy a different product from me after they purchased the first product. I was utilizing upsells, downsells and One Time Only Offers. I searched and found every after-sale technique available and applied it to my online business. It took some time, but I finally perfected the process. Im now able to sell two, three ever four different products in the same transaction. Each customer of mine is squeezed until there isnt any money left to spend and Im sitting pretty, finally happy to be working online. Let Me Show You How To Squeeze Every Dime Out Of Your Customers Too! *Implement The #1 Tool Every Successful Online Business Uses! *Make Sales You Never Thought Possible Before! *Create A Cross Selling Bonanza! *Use OTOs, Upsells and Downsells Just Like The Pros! *Sell To Each Customer Not Just Once, But Twice, Three Times...Even Four Times! 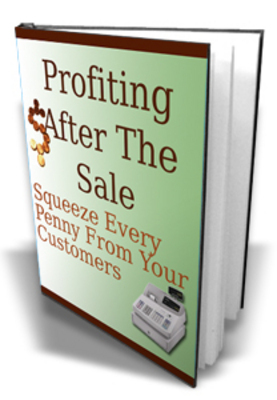 Understand How To Squeeze Every Last Penny Out Of Each Purchaser! Dont Be Left Struggling To Make Money, This Is Your Chance To Hit It Big! Do you believe you are doing all that you possibly can do to make money online? Do you believe that your efforts could be strong, better, faster and easier? Chances are, they can be. If you are beating you head against your desk trying to drive 100s of people to your site just to make an extra couple of sales, you could make those same extra few sales without any of the hard work just by selling to the people whove already bought. Its a well established fact that its easier to get an existing customer to buy again than it is to get a new customer to buy once. Learn how you can do take advantage of these marketing secrets. Dont hesitate, buy Profiting After The Sale today. Profiting After The Sale will explain everything you need to know so you can start to profit right now.